A few pics from the last few weeks of summer. We love our lazy summers, but I think we are all ready to get back into a routine, start soccer, and for Kate to start her first year of preschool! 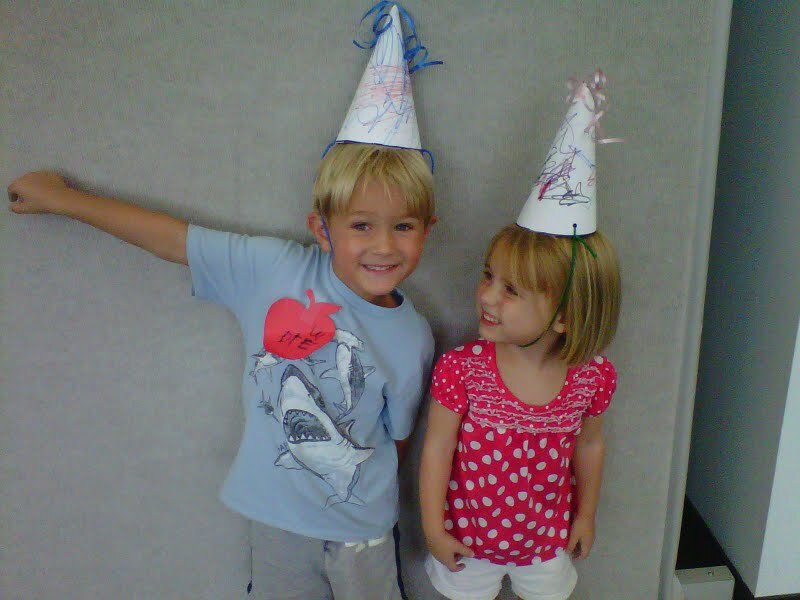 Happy 4th Birthday to Drew's friend, Clark! Fun at the pool: A favorite pasttime to get us through months of 100+ degrees! 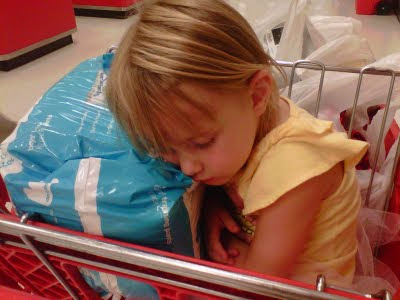 Oops-shouldn't have skipped her nap! Another 4th Birthday party! Happy Birthday, Gabriella! Library class has started back up again! Birthday theme so they made these cute hats! Water balloon fight with Daddy! We are now on the hourly countdown for our trip! I will NOT be blogging while on vacation-just me and the hubs and Hawaii-BRING IT ON! We just knew he was going to be a boy. We didn't find out the gender with either of our kids, but we just knew our first was going to be a boy. It was barely a surprise then, at 40 weeks and 1 day, the doctor said (after 3 hours of pushing)"It's A Boy!" Fast forward 4 years, and Drew continues to amaze us with his sweet personality, confidence, desire to learn, and enthusiasm for life. I could not have picked a better big brother for Kate and we are truly proud of the little person he has become. I can't wait to see what is in store for this guy! He woke up yesterday wondering why he wasn't any taller. He also started asking questions about how he got out of my belly and how he got in there! Not ready for those questions quite yet! Of course, the last thing Drew said to me before going to bed last night was "How many days until I am 5?" Oh boy, this is going to be a long year! We went to the doctor today, and the poor guy endured 5 shots! Yes, 5! And Kate had to get 2, so there were some tears this morning. He measured 90% for height, and 65% for weight. We know he is going to be tall like his Daddy! I know he is growing because he is still napping like a champ, eating me out of house and home, and his new shoes are size 11's! Drew turns 4 on Tuesday, but we had his pool and pizza party a little early so visiting cousins could get in on the action! Unfortunately, Drew got sick during the pool portion of the party! He had a fever and chills and was in bed halfway through the party. Poor guy-I am going to have to make his actual birthday extra special for him! Despite the sickness, everyone had a good time and we carried on while he was in sleeping. Here are some pics of the invites, cupcakes, and party favors in case you need some ideas for your own shark party! I like to keep things simple and a little homemade. I decided I wanted to make his invitations by hand this year. I went in seach of some ideas and came across this post at Polkadots and Pirates blog. She threw a shark party and made her own invites for her son and I copied her idea! These didn't take long to make and I love the way they turned out! Made entirely out of cardstock and printed on Word. Cut your pieces and assemble! I used plain white envelopes purchased at Hobby Lobby (with a coupon, of course!). I made my template on Word based on the 5 x 7 size of the envelope. I also decided I wanted to make homemade cupcakes. My sister was in town and she took the reigns on this (thank you!). We used store bought cupcake mix and my sister made her own frosting. She dyed it blue to make it look like waves, and I added gray shark fins for a little added touch. We gave each child Swedish Fish and a shark pool ball to go along with the theme. Cheap cellophane bags and a little ribbon and that's it! Here is the sweet guy before he fell ill! I will gush about him on his actual birthday blog post! My sister and her family came for a long visit recently. They live in Iowa, and we love having them in the south! Our kids are very close in age, and all of the cousins act like brother and sister. It's as if they just know they are family! Having a drink at The Friendly Spot! Hanging out in Gruene, TX! They could be triplets! These two will be the sister neither of them have! Texas Pride BBQ-such a fun, Texas place to eat! 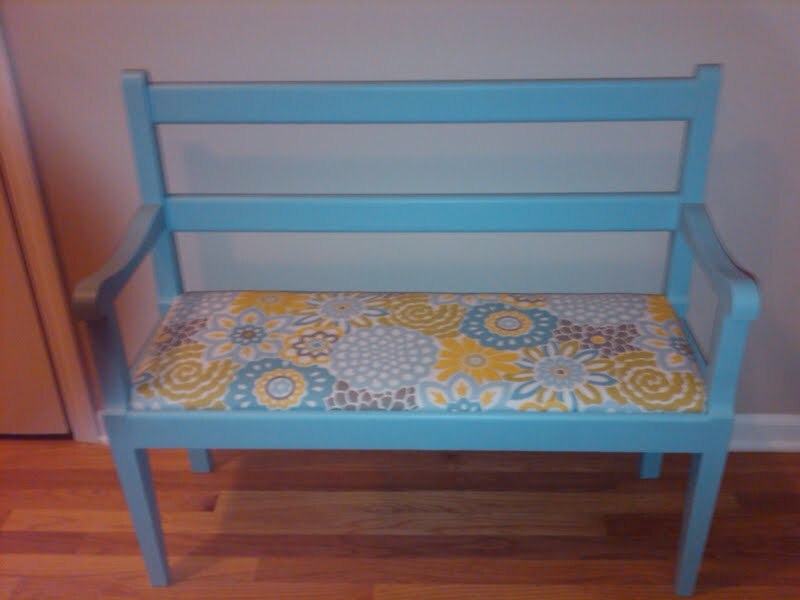 While I was in Chicago recently, my Mom purchased a really cute bench for $10 at a church yard sale. She decided to put it in a spot in her entry/foyer. Of course, I love a good project and makeover, so we quickly got to work before I left! This is the final product (sent via cell phone)! Unfortunately, I don't have a before shot, but you get the idea. Smaller scale bench, dark wood, and removable seat cushion. Here is my Mom painting away! The paint color we chose was Geyser by Martha Stewart. We chose that color after picking out this fabric at JoAnn's. This fabric was $24.99/yard, we got it for 50% off, and we only needed 1/2 yard. Total fabric cost was around $6. This was a family project as my Mom painted, and my Dad removed the previous fabric on the bench. Above are the supplies we used to recover the bench. The burlap was already in place, so the seat did not need any additional batting. I find it is always easier to have a second set of hands to help keep the fabric in place while stapling. Especially with those pesky corners! This project did not take long because we had 3 people helping! How cute is little bench?? I wanted to bring it back to TX with me! I know my mom is now on the hunt for a cute little pillow to place in the corner. I use a lot of paint and wood stain for different projects in my home and pieces I sell. In the past I have been diligent about using rubber gloves when staining. Lately, I have just been using bare hands when using smaller pieces. The gloves seem clumsy and in the way. That being said, my hands and nailbeds look like I have been working on cars all day! Not cute! I searched the internet and found out that I could use vegetable oil to remove wood stain from skin. I poured a little in a bowl, soaked my nailbeds and hands, scrubbed, and washed with dishsoap to remove oil. I did this process twice and to my surprise, it worked! !